Then, a keyword 'MD.type' is specified as 'Opt', and set to 200 for a keyword 'MD.maxIter'. The 'Opt' is based on a simple steepest decent method with a variable prefactor. Figure 8 (a) shows the convergence history of the norm of the maximum force on atom as a function of the number of the optimization steps. We see that the norm of the maximum force on atom converges after the structure overshot the stationary point because of change of the prefactor. Using 'Methane2.dat' in the directory 'work', you can trace the calculation. As well as the case of the methane molecule, a similar behavior can be seen for the silicon diamond as shown in Fig. 9(b). 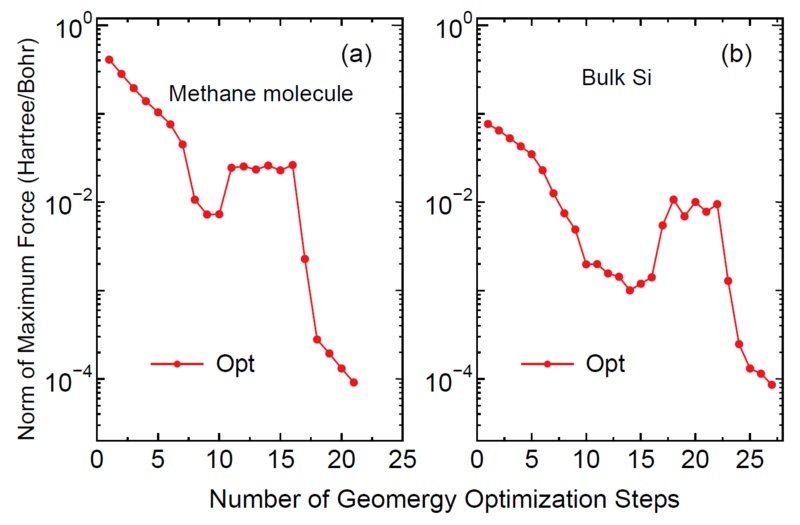 Figure 9: The norm of the maximum force on atom of (a) a methane molecule (b) silicon in the diamond structure as a function of geometry optimization steps. The initial structures are ones distorted from the the equilibrium structures. The input files are 'Methane2.dat' and 'Si8.dat' in the directory 'work', respectively.